Songs of Eretz Poetry Review is pleased to present "Dreamcatcher" by John C. Mannone. Mr. Mannone has work appearing in: The Southern Poetry Anthology (Volume VII, NC), Still: The Jourmal, Pine Mountain Sand & Gravel, Negative Capability, Split Rock Review, Agave, Tupelo Press, Raven Chronicles, Poetica Magazine, Synaesthesia, 3Elements Review, The Baltimore Review, Rose Red Review, Pirene’s Fountain, Tipton Poetry Journal, Prairie Wolf Press Review, The Pedestal, Motif v2 & v3 anthologies, and others. His collection, Flux Lines, was a semi-finalist for the 2014 Mary Ballard Poetry Chapbook Prize. He’s the poetry editor for Silver Blade and Abyss & Apex, and an adjunct professor of chemistry and physics in east Tennessee. His work has been nominated three times for the Pushcart. Visit The Art of Poetry: http://jcmannone.wordpress.com. filled with webbing, the nettle fibers stranding rim. web to sift the restless thoughts while we all dream. monsters that eat our freedom, but sadly are dismissed? the hawk feathers, that wisdom dwelling in the quiet night. moving ever so gently in the window, in the gentle breeze. Poet’s Notes: When I wrote this poem for Tupelo Press, I had been thinking about Sacred Flute, my collection of poetry infused with Indian culture, legend and history. I had just read the poem, “Securing the Line,” by Kimberly L. Becker http://www.amazon.com/The-Dividings-Kimberly-L-Becker/dp/162549064X, a Cherokee poet (The Dividings, WordTech Communications, January 2014), who uses an interesting metaphor: the poet snares words, as a spider captures prey. 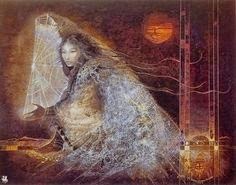 Though not directly, this led me to the legend of the dreamcatcher (and of the “spider woman”) http://www.firstpeople.us/FP-Html-Legends/TheLegendOfTheDreamcatcher-Chippewa.html. In my poem, I start with a dreamcatcher, but soon transcend beyond description and beyond legend. Two extensions develop with a dreamlike, even nightmarish mood. One is external and macroscopic, hinting at the socio-economic political turmoil in the world, while the other suggests an internal and the personal darkness of the narrator. The structure of the poem—a series of tercets surrounding a single line—not only goes to the symmetry of a dreamcatcher, but also provides a pivot that bridges both worlds. Editor’s Note: Mr. Mannone’s verses create a dream-like mood that compliment the poetic conceit perfectly. The single-line stanza in the center of the poem that recalls the symmetry of the dream catcher webbing is a nice touch. The turn is smoothly executed, and I love the message about the metaphoric nightmares that now threaten all of humankind. “Dreamcatcher” was first published in Tupelo Press in March 2014 and was reprinted in the February 2015 issue of Songs of Eretz Poetry E-zine.